Hummingbirds flock to this backyard retreat. The Patons didn’t choose the bird life, the bird life chose the Patons. 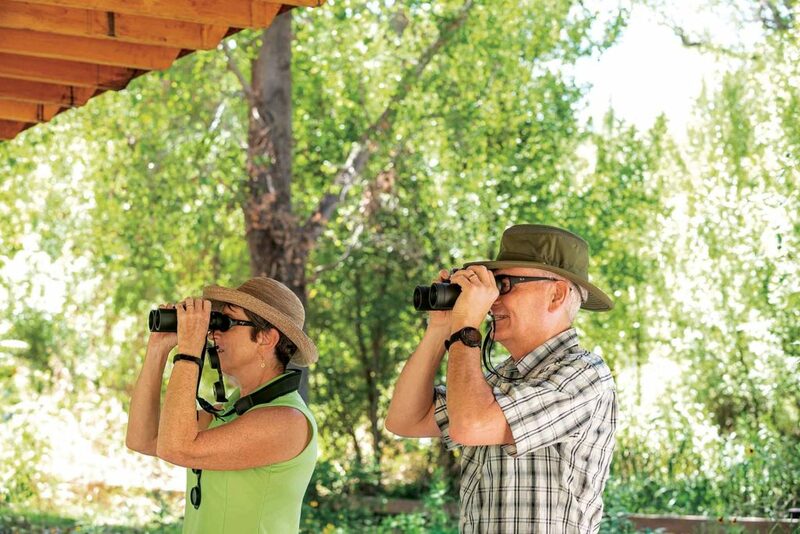 The events to follow culminated in what was once simply the couple’s Patagonia, Arizona, yard becoming their legacy—one which shall benefit birds and bird watchers indefinitely in its new life as the Tucson Audubon’s Paton Center for Hummingbirds. to rival any proper New England garden. They enjoyed the antics and beauty of the hummingbirds in particular, so they installed several feeders along the whitewashed cinder block back wall of their home. Before long they noticed more than just hummingbirds showing interest in the feeders. Bird watchers on their way to the adjacent Sonoita Creek Preserve were often lined up along their fence with binoculars fixed on the feeders. First-time Paton Center visitors Paul and Ruth Ann Kurtin score the violet-crowned as a life bird within minutes of arrival. “In the early ’90s, Art [Arthur] Morris, a famous bird photographer, heard a rumor birders were regularly spotting a very rare hummingbird, the violet-crowned, at the Paton’s feeders,” says Tina Hall, birder and Paton Center coordinator. He showed up to the house, took a bunch of photos and wrote a story called “Hummingbird Hosts” for Bird Watcher’s Digest. The Patons’ yard soon became a must-stop for birders visiting the region. Lucky for those hoping to catch a glimpse of the famed and elusive violet-crowned, the Patons were the friendly sort. They invited those peering from a distance into their yard for a closer look at the iridescent acrobatics of the hummingbirds they themselves so loved to observe. After Marion and Wally passed, Moon pursued avenues to keep her parents’ yard open to birds and birders alike. Eventually funds were secured from the American Bird Conservatory and Victor Emanuel Nature Tours to purchase the property. It was then transferred to Tucson Audubon Society for management. They’ve made some improvements, such as installing a permanent, handicap-accessible pavilion with benches for viewing the feeders still strung along the iconic white wall as well as adding feeders and planting more native plant species. Despite changes, those involved hope to maintain the backyard feel. “There are a lot of places to go and bird, but at the Patons’, it’s a real intimate feeling. People who don’t know each other sit down and make friends. We call it the Paton Effect,” Hall says. 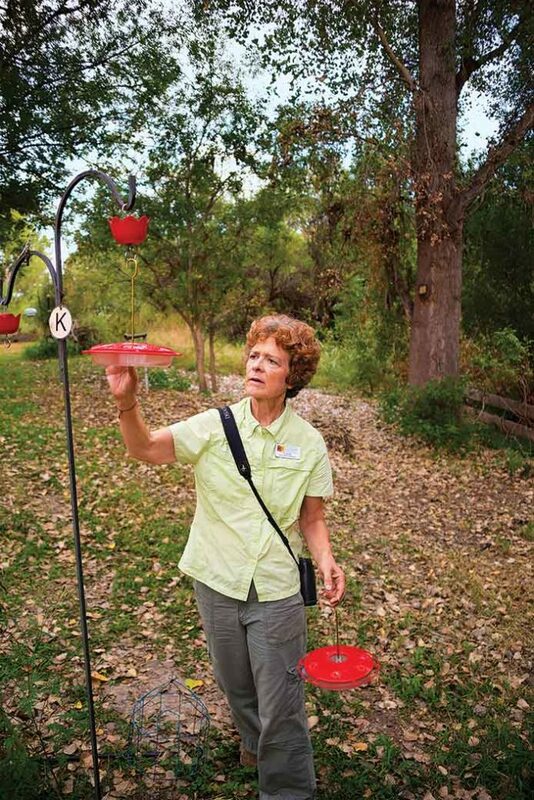 Tina Hall fills one of the 27 feeders dotting the Patons’ former yard that support up to 7 species of hummingbirds throughout the course of the year. Hall, along with a dozen volunteer workers and docents, work diligently filling 27 feeders each morning and periodically throughout the day, weeding, planting, maintaining water features and interacting with guests. They get birders of all levels, allowing the docents to learn from some and pass along information to others. Their goals include education on feeding and creating habitat. The former horse meadow, once overgrown by invasive weeds, has been planted to a wide variety of native flowering species, becoming an official Monarch Waystation. When birders tire of following the frantic movements of the darting hummingbirds, they can downshift to the more relaxing observation of the equally beautiful butterflies sedately floating their way about the acreage. There are two large dry erase boards on the property, one with a list of the 231 bird species that have been seen on the property and one listing butterfly species. Volunteers update the boards indicating when, and how frequently, each species was last spotted. This helps guide visitors to what birds or butterflies they are most likely to encounter as they amble the winding trails and observe from the benches interspersing the 1.4-acre property. It’s exciting for all involved when a guest spots a life bird. Hall explains most birders maintain a list of birds they see in their lifetime. The first time they spot a species on the list, the bird seen is called their life bird, as in it was the first time in their life they saw it. Hundreds, likely far more, have caught their first glimpse of a violet-crowned hummingbird, the rare bird that started the Paton fascination, during a visit. 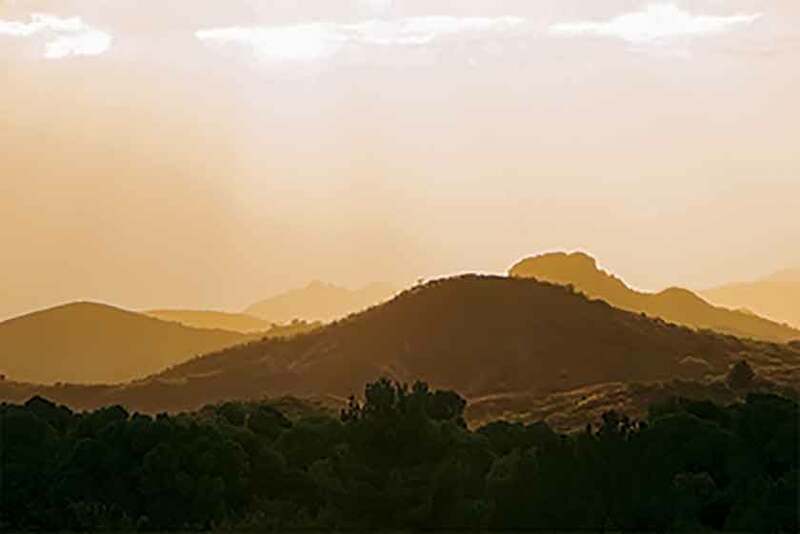 Area mountains make up Sky Islands, isolated habitats for a diverse range of plant and animal species. Paul and Ruth Ann Kurtin of Rochester, Minnesota, were visiting the center for the first time in September. Relatively new to birding, they were excited to have seen a violet-crowned, and were clearly warming to their new hobby. “Hummingbirds are attractive because they’re so territorial. They’re very acrobatic and tremendous fliers. It’s fun to watch them flit about the air and fight one another over nectar turf,” says Paul. Both enjoyed the tranquil, backyard feel the Paton Center continues to foster, and they struck up lively conversations with several volunteers on hand that day, including Kirk Stit, a visitor turned volunteer. Hummingbirds are a “New World” species, found only in the Americas, so the Paton Center attracts birders from far and wide. “We’ve had visitors from 21 countries and all 50 states,” Hall says. Designers showcase garden playgrounds for children of all ages. Tips for raising livestock on a small homestead.